Ana Lisa is an independent writer and curator born in Buenos Aires and trained as an eco-designer at Goldsmiths University of London. In addition to writing for 6sqft she is a frequent collaborator at NYC’s Inhabitat, where she reports on global design week events and sustainable architecture. She also contributes to Australian BlackleMag, Argentina’s Casa Foa magazine and Inhabitots. 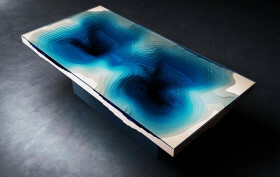 She loves Japanese architecture and Dutch design, and is constantly in search of good ideas to share with the world. Currently she splits her time between Buenos Aires, NYC and The Netherlands. Back in 2004, a client with a taste for traveling approached CWB Architects to design a beach house with a distinctly Asian flavor, styled after houses he’d seen in Thailand and Japan. 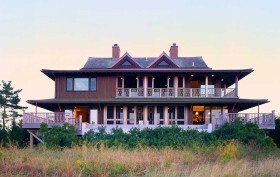 The result is this stunning, appropriately-dubbed ‘Thai Style Southampton’ home, which stands on stilts above a wetland. In addition to verandas, pointed gable roofs and Mahogany interiors, the charming home features a splendid view out to the Atlantic Ocean. Less is more for just about everything when it comes to cramped NYC apartments; the notable exception, of course, being light. So here’s a brilliant design that strikes a perfect balance between being hidden but also visually arresting when it needs to be. 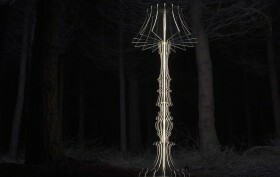 Sander Mulder‘s Josephine Lamp is a standing luminaire that takes on an almost ghostly form, only becoming apparent when one switches its on-off button. If you think the Hamptons is only for Hollywood stars who can afford the glitz and glamour of life, you might want to look at the summertime playground’s hidden gems like CCS Architecture‘s Watermill Residence. 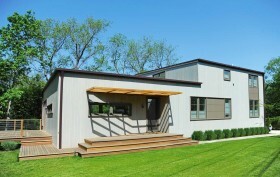 The modest retreat was designed for a developer who wanted to sell property to new buyers at a moderate price level. A perfect starter home, it offers a down-to-earth vibe thanks to the architects’ simplicity and casual modernist taste. When Janice Parker Landscape Architects arrived at this Connecticut site, they found the remains of what used to be a farm, with the bones of a house, barns, fields, woodlands and a fruit orchard. The architects were taken by the lovely piece of land and its countryside history, so created the wood-clad Modern Barn House as an homage to the property’s past life. 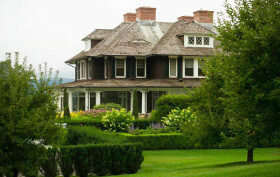 They also incorporated the apple orchard and redesigned the landscape to include a large patio and infinity pool. 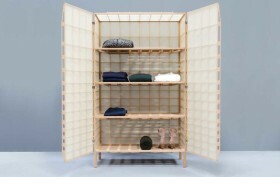 Minimalists who’ve gotten a little carried away accumulating a few too many clothes, shoes and other goods will appreciate this streamlined wardrobe design by Rianne Koens. Called Otura Dirsek, this beautiful storage solution is inspired by, and named after, the copper gas pipes seen in Turkish homes. Rather than placing the pipes behind walls, Turkish people instead run them along the exterior, conveniently creating extra space to hang household items. 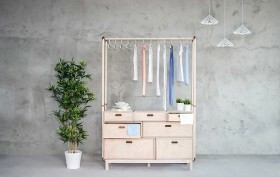 Dutch designer Mieke Meijer has created a cabinet that, while ideal for housing clothing or linens, is much more than just a storage piece. Called Airframe 01, it draws inspiration from the wings of early 20th-century airplanes, which were light, wooden structures covered with translucent white textiles. Simon Morris — a New York City-born, Stockholm-based scientist — has created a revolutionary wireless light bulb that floats and gently rotates while it shines. Called Flyte, a combination of Flying and Light, the magical high-tech lamp takes inspiration from Tesla‘s magnetic levitation technologies to defy gravity, hovering above a wooden base. Flyte can be switched on and off by touching its base, it need no batteries, and has an amazing lifespan of 22 years. Plus, the base doubles as a wireless charging station for smart phones and other devices.